Description: Want to get some vegetable servings in at breakfast? This is a great, healthy breakfast (you'll see it uses Egg Beaters instead of regular eggs) to get your protein, fiber and vegetables all in the morning! Instructions: Spray a medium pan with PAM. Chop up your tomato into bite sized pieces. When finished, put the pan on medium-high heat. Add the frozen pepper (it will be steamy!). Add the chopped tomato to the pan too. Move the pepper around for 5 minutes or so as it defrosts. When the pepper and tomatoes appear cooked, add the yellow Egg Beaters (let it boil up and gently move it around the pan). Add in the parsley, pepper and red pepper flakes. Cook for a few minutes until it is no longer liquid! Enjoy--feel free to top with hot sauce, ketchup, or even sugar free syrup! 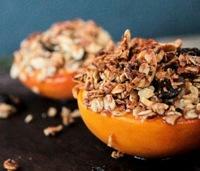 These Baked Granola Peaches make a sweet and healthy breakfast or just add some vanilla ice cream to turn it into a mouthwatering dessert! All the flavors of cobb salad--for breakfast! It's filling yet refreshing. 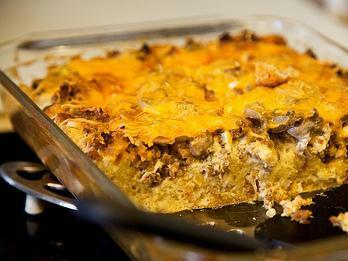 This breakfast casserole is delicious!! The whole family will enjoy. 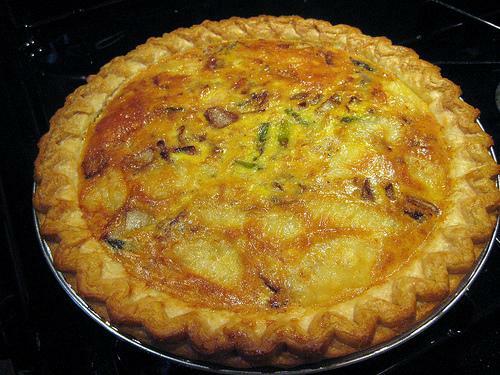 This quiche is so easy to make that you'll be wanting to whip it up for more than special occasions!